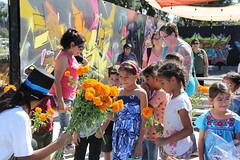 The Civil Rights Movement Comes to Life in Southeastern San Diego! 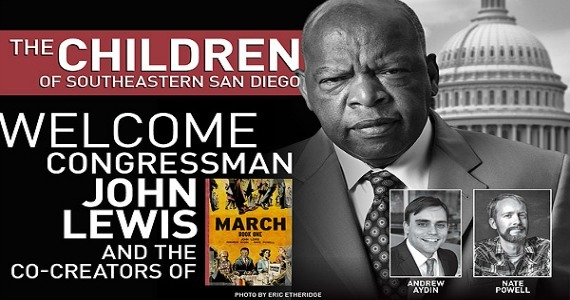 Activist and respected member of Congress John Lewis and his award-winning co-creators Andrew Aydin and Nate Powell of the graphic novel series March make a special presentation following their 2015 Comic-Con appearance. Don’t miss your chance to hear from someone who marched alongside Dr. Martin Luther King Jr.
March has become a key resource to teach the next generation about a pivotal moment in our nation’s history. Congressman Lewis is an international icon, and his story is now more relevant than ever. See why this project has become such a phenomenon – Join the March! All are welcome to attend this FREE event. Space is limited. 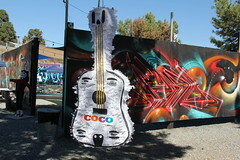 Reserve your ticket online at MarchinSESanDiego.EventBrite.com or call Evonne Smith at 858.361.2562. Please plan to arrive by 2:45 pm. Arrive with everyone in your group. The program will start and doors will close promptly at 3:30 pm.